Last Sunday the Mt. 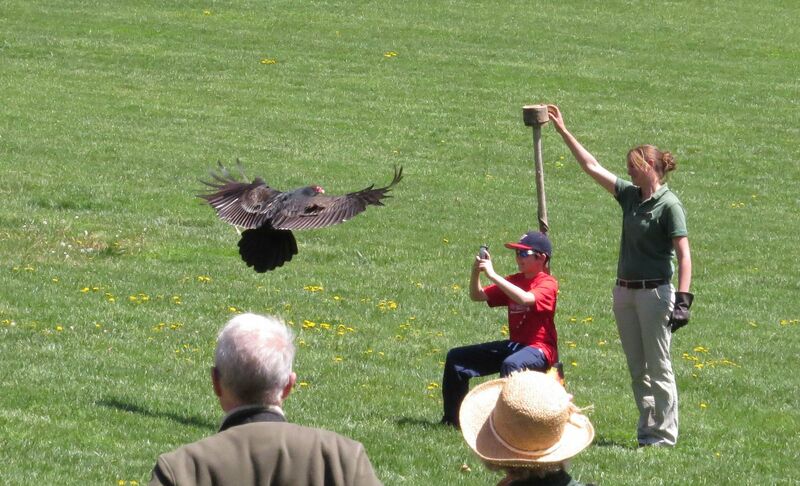 Cuba Center held their 10th annual Wildflower Celebration. This has truly become an event I've tried to attend every year ever since I learned about the place. The gardens there are spectacular as always, however because of the long winter we had I feel that the general peak bloom of the place was 2 or 3 weeks behind. Fern-leaf Phacelia, Phacelia bipinnatifida, had only just started to open. 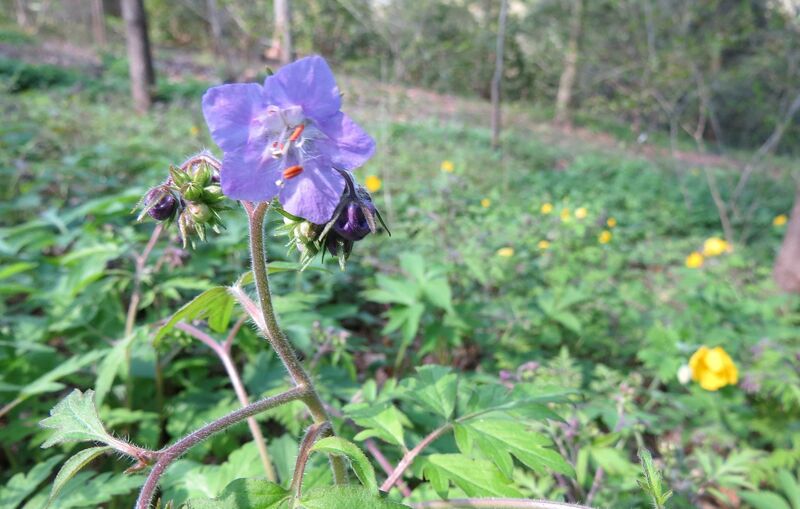 And even the May Apples which are very abundant in parts of the forests there weren't blooming yet. I was slightly impressed to find a Toothwort, Cardamine concatenata, still blooming from two weeks ago when I had visited before for the early spring blooming tour. 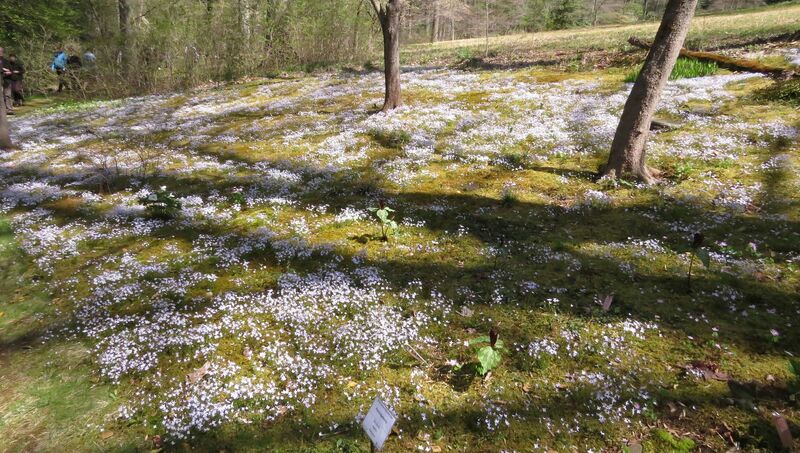 Other plants I saw then like Hepatica, and Bloodroot were pretty much completely done flowering for the year. 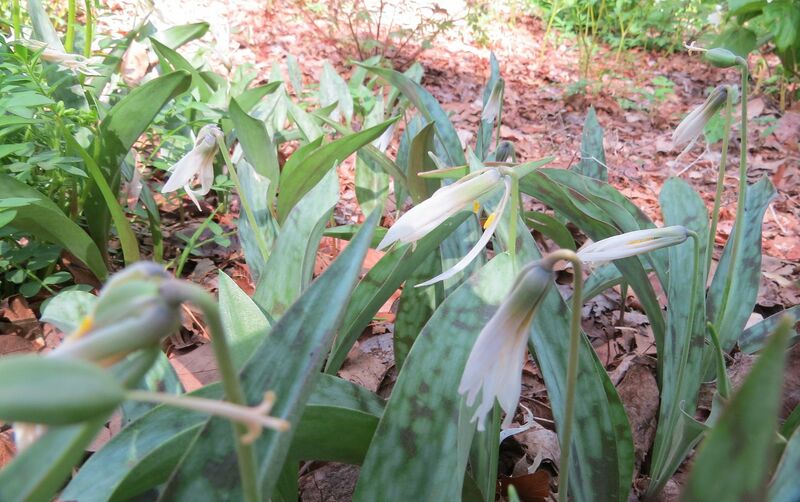 There were more Trout Lillies flowering but most were past their prime. Even so, the flowers were interesting and pretty to look at. 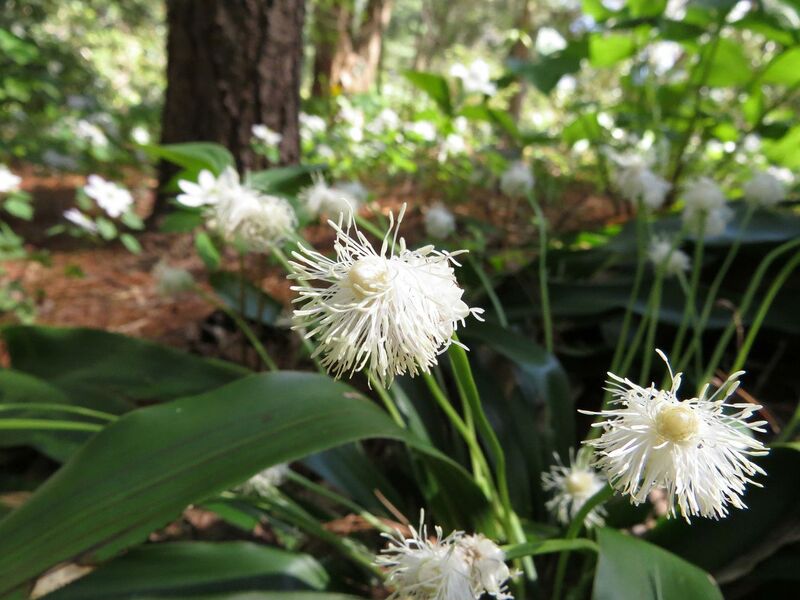 The White flowering species must have also flowered after my previous visit and had since faded on the day of the celebration. That's kind of the charm of going every year though. 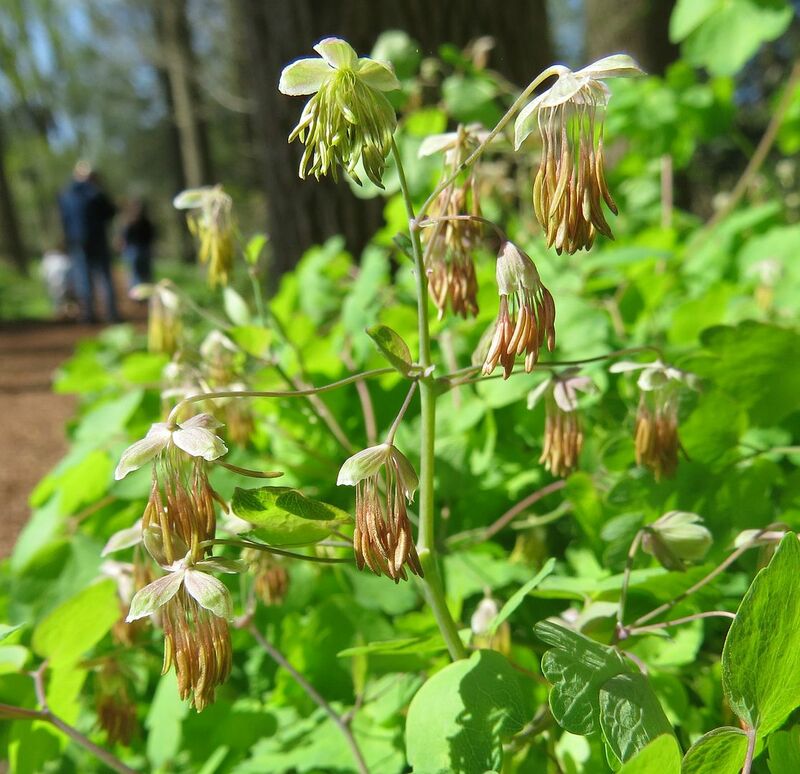 Some years there are carpets of flowers all over the place, and others it's little hints of wildflowers you might not have noticed. 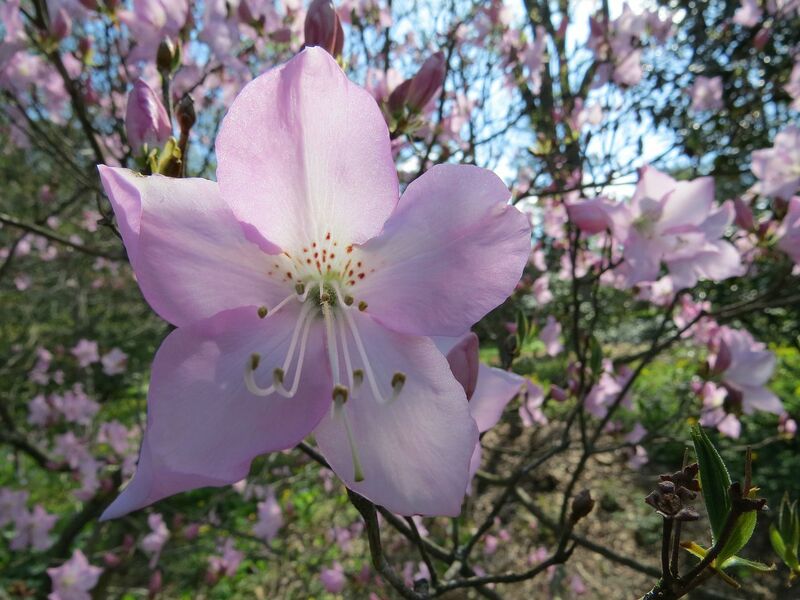 A Rhododendron. Bumblebees were working this but refused to stand still long enough for me to get a good shot. 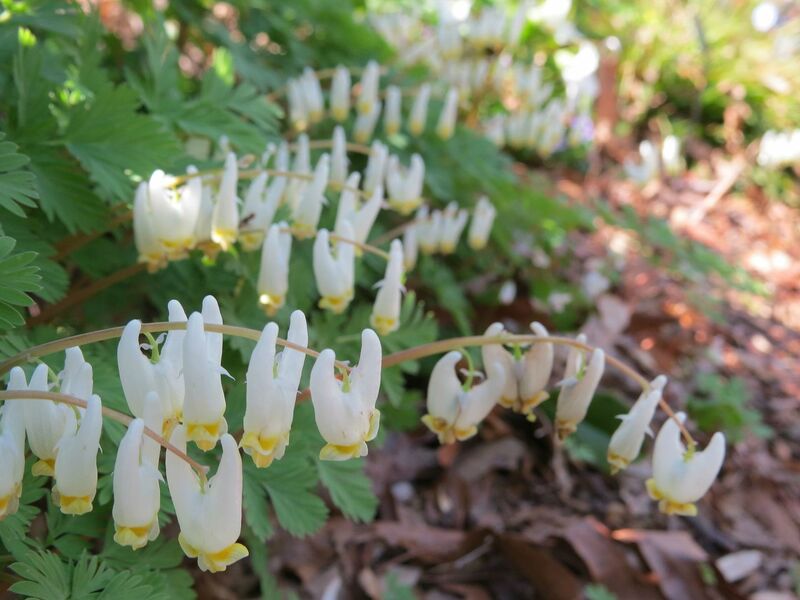 Dutchman's Breeches, Dicentra cucullaria, get their name from resembling pants. 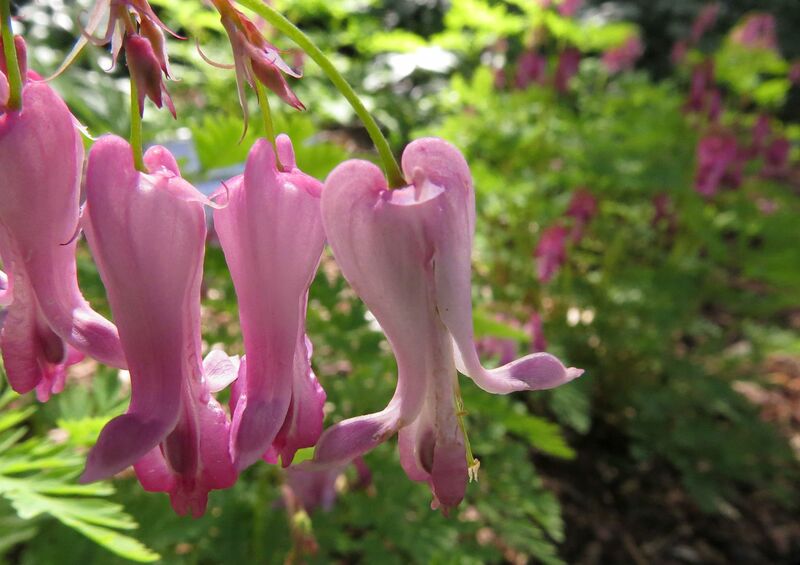 Turkey Corn, Dicentra eximia, because they're not really heart shaped enough to call them bleeding hearts. Green and Gold, Dicentra eximia. 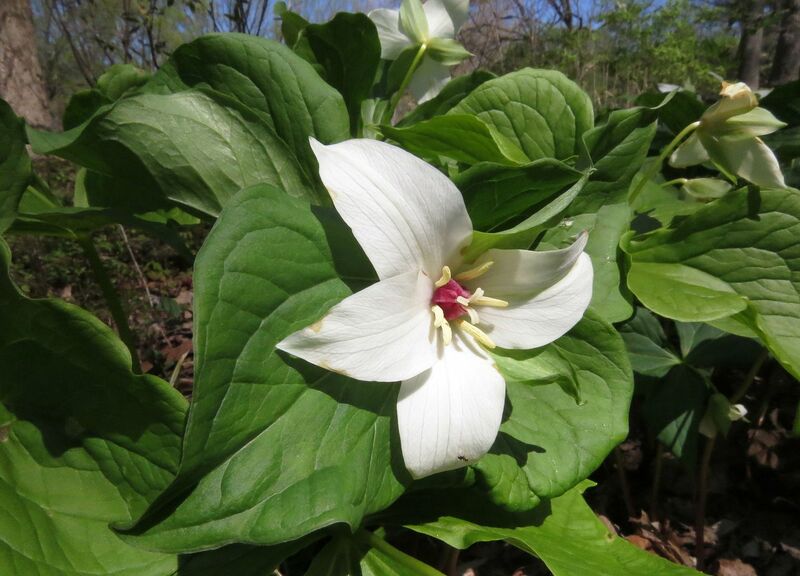 This is one of those wildflowers native plant gardeners like to gush about. Honestly it's never impressed me, though I read it has a very long bloom time. Maybe I'll plant it someday. Fraser's Sedge, Cymophyllus fraserianus, a flowering sedge that actually has showy flowers. Rue, I think. This is wind pollinated but you can still occasionally find bees going after the pollen. 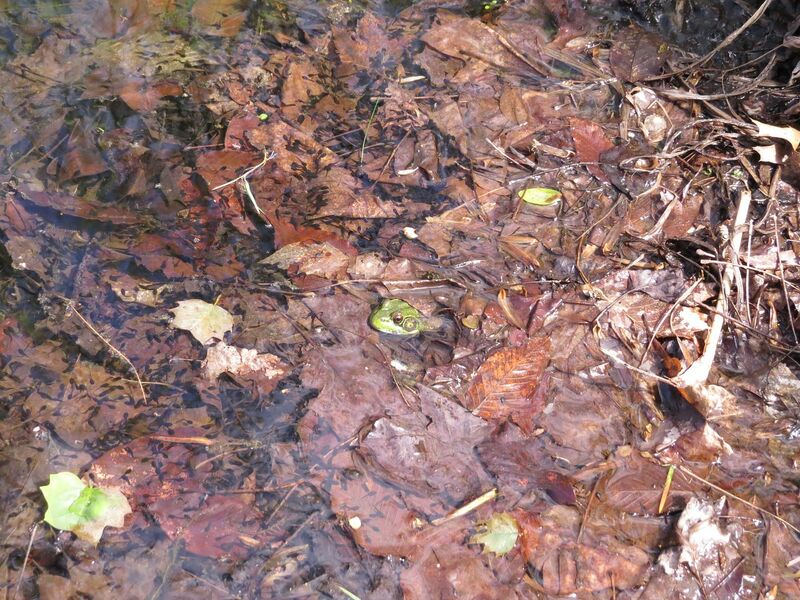 The ponds were extremely abundant with tadpoles this year. There were spots with so many of them that you couldn't see the bottom of the pond. I'm told something like 5 species of frogs use their ponds as a spawning pool. None of which were added, they all showed up on their own. 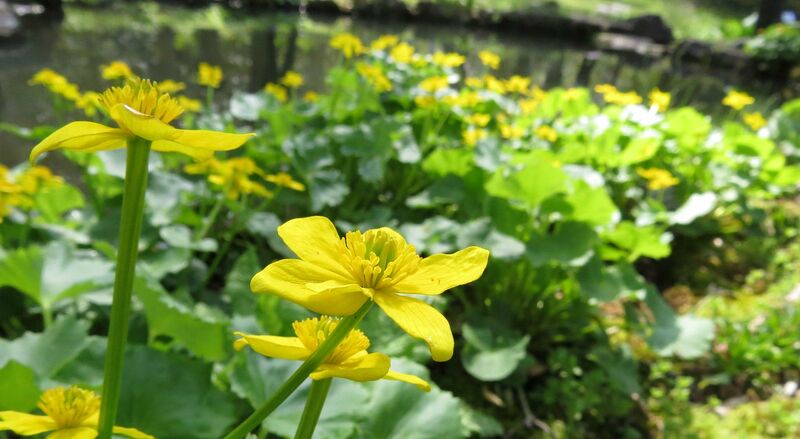 Marsh Marigold, Caltha palustris, was abundantly in bloom around their ponds. 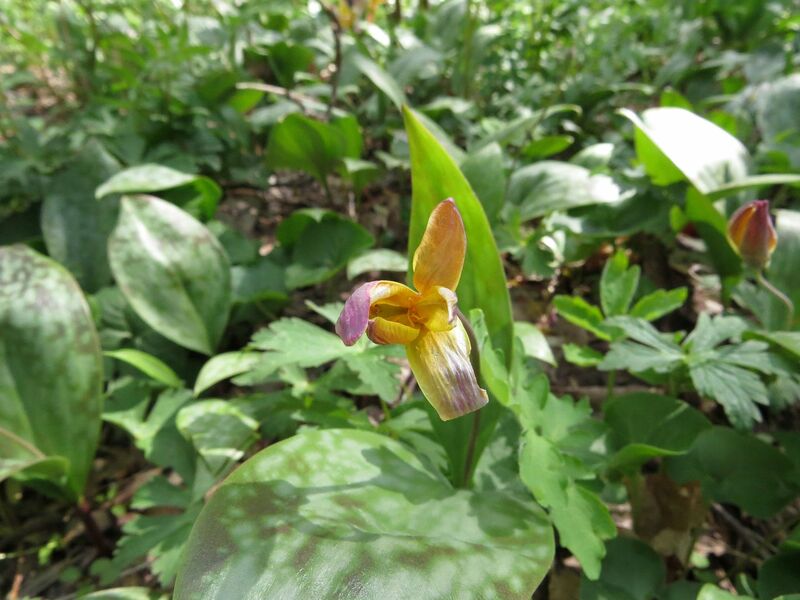 This was the first year I saw this plant blooming at it's peak and the nonnative they have there not. The Mt. Cuba Center isn't totally native, partly because of the former owner of the estate. 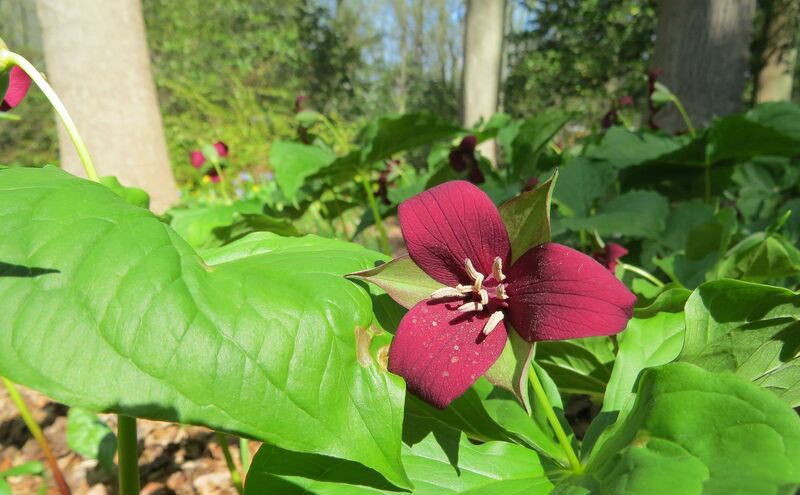 Her name was Mrs. Copeland (hope I'm spelling that right,) and while she was devoted to creating a wonderful native plant garden, a few of her favorite nonnatives still grow in the gardens. She had a saying I'm told that went something like, "If it isn't native, then it ought to be." 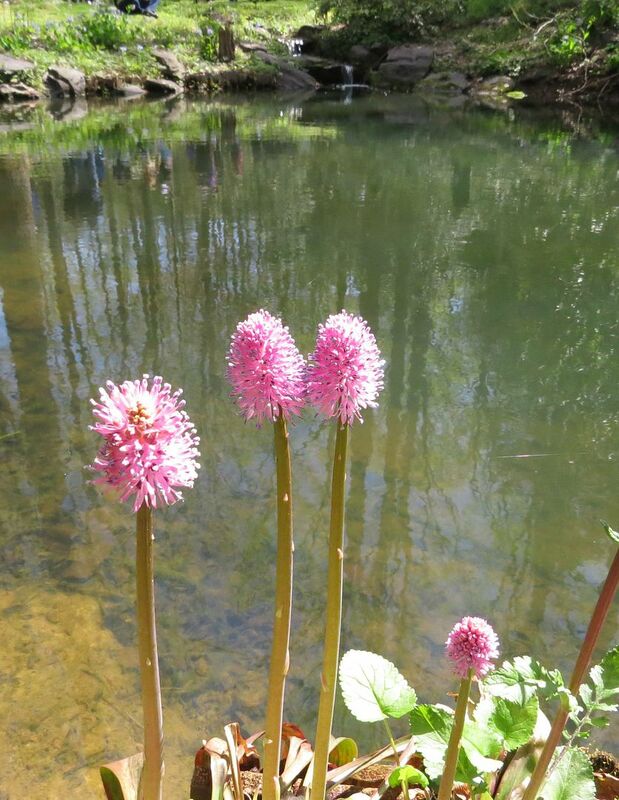 So on most years I'd see Japanese Primroses, Primula japonica, all over the pond area adding some vibrant magenta and pinks to the color spectrum. I have to admit they are pretty plants but not fitting with the theme. 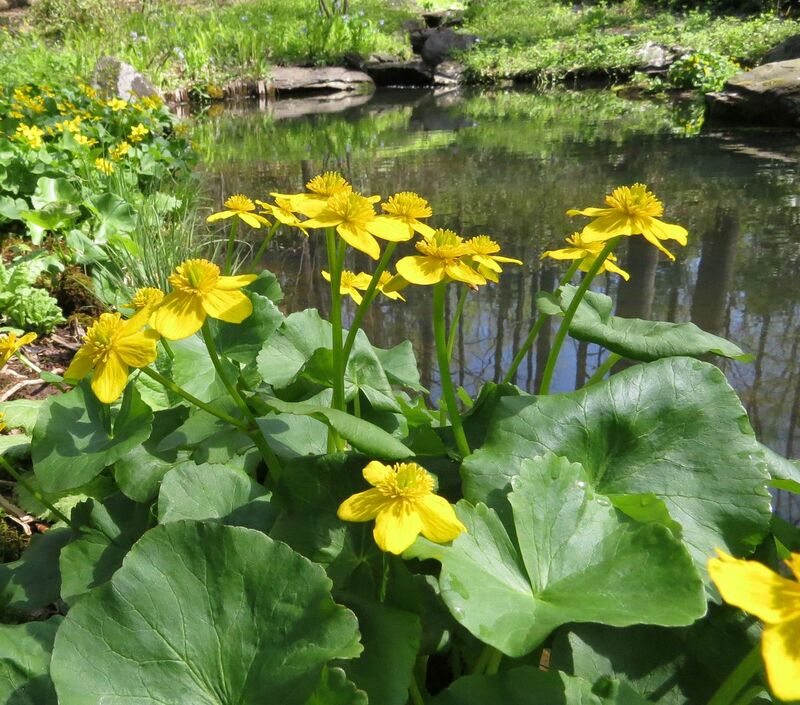 I've been meaning to add Marsh Marigold to my pond at home, which can grow is fairly flooded conditions. 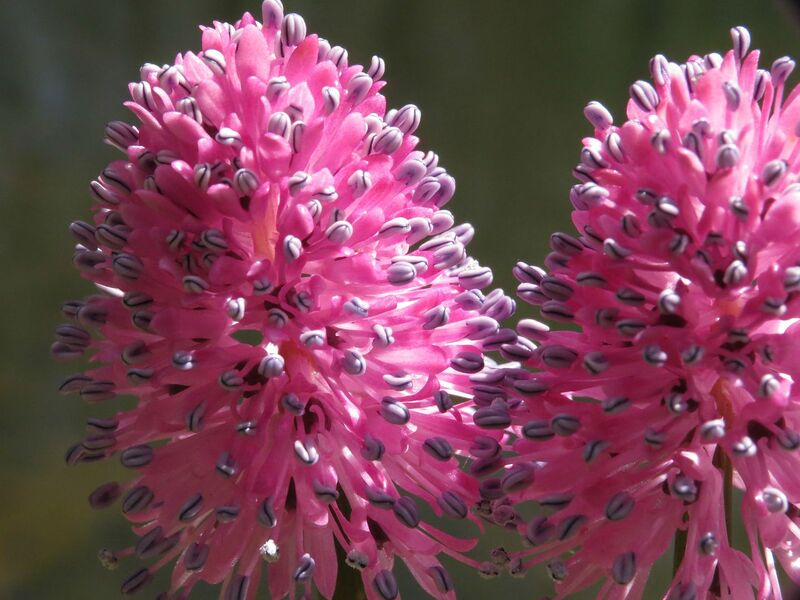 Swamp Pink, Helonias bullata, an endangered species (though only threatened in some states) was just starting to bloom in patches here and there. This is a nice pop of color but doesn't spread enough to be productive in the horticultural industry. The one nursery I knew that was able to germinate the seeds found that they require an exact amount of cold hours, nothing more and nothing less to get the seeds to this plant to germinate. 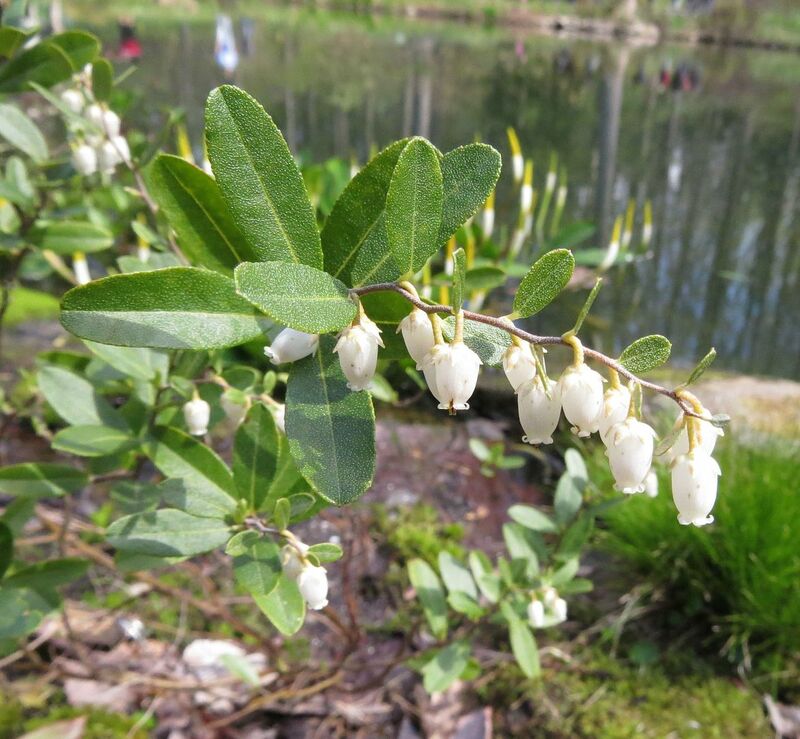 I'm not 100% sure but I think this is Bog Blueberry, Vaccinium uliginosum. This was a blueberry shrub they had planed right in the flood area of their ponds, along side pitcher plants and bog sage. 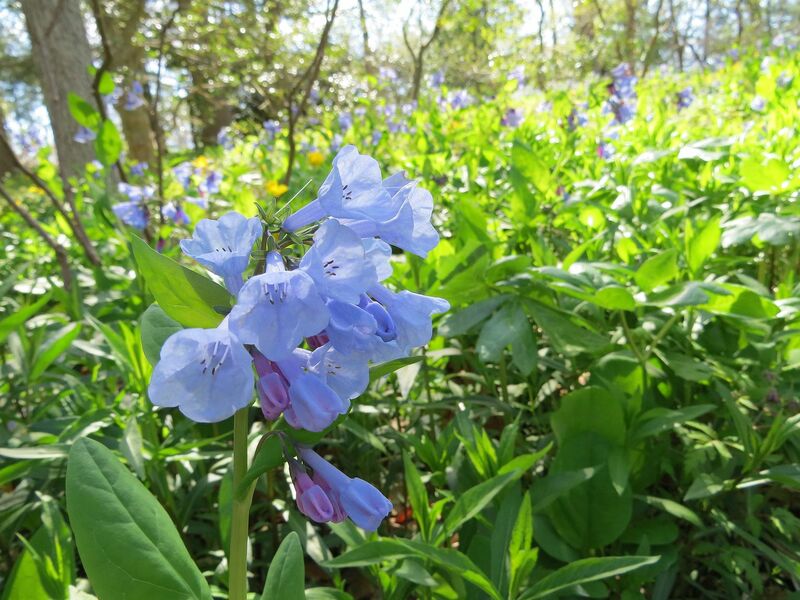 Virginia Bluebells, Mertensia virginica. This was the main burst of color on the forest floor this year. 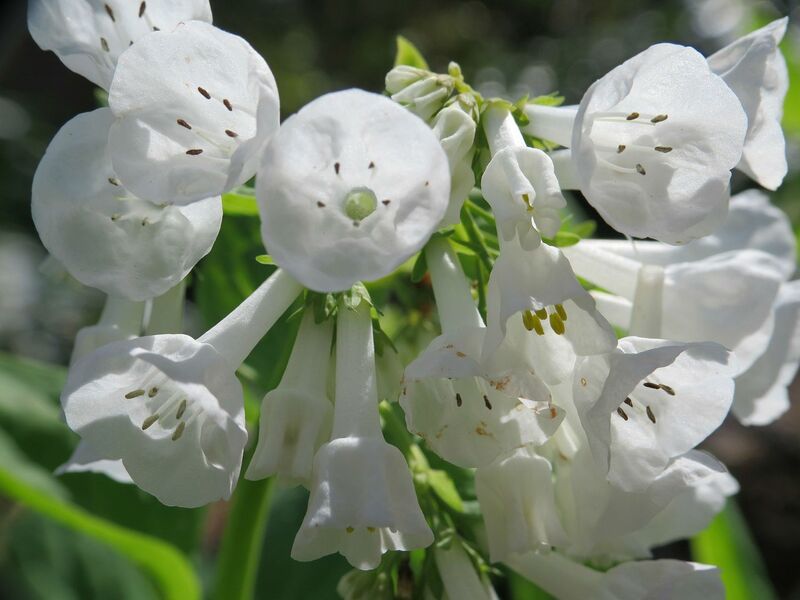 It's a wonderful perennial that forms a deep tap root. Some have said it's hard to get rid of once established and does spread freely by seed. Honestly though the gardeners there seem to keep it under control. I'd say the Woodland Poppy spread way more prolifically. 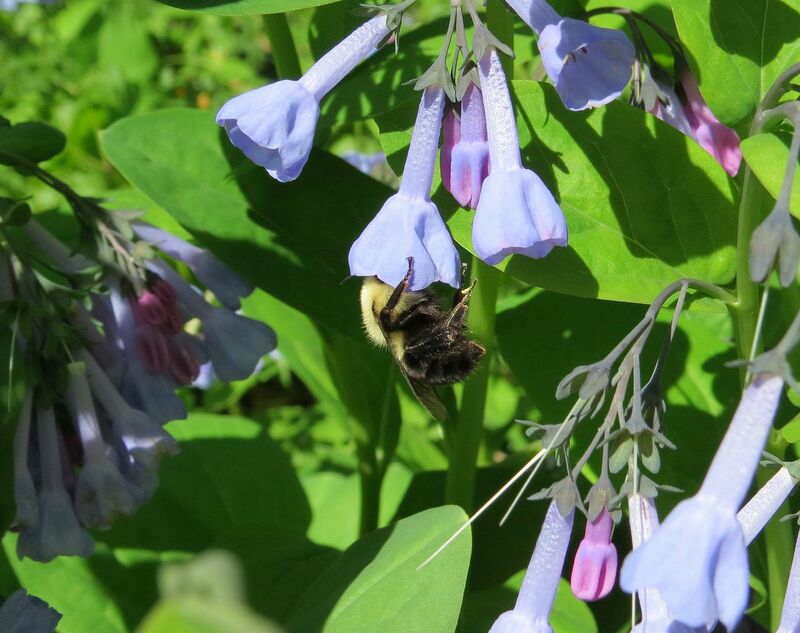 This was one of the few plants that bumblebees were actively working. Here a young queen (they're all pretty much queens this early in the year) is gathering nectar from one. This would have been fuller looking had they held the event in two or three weeks. 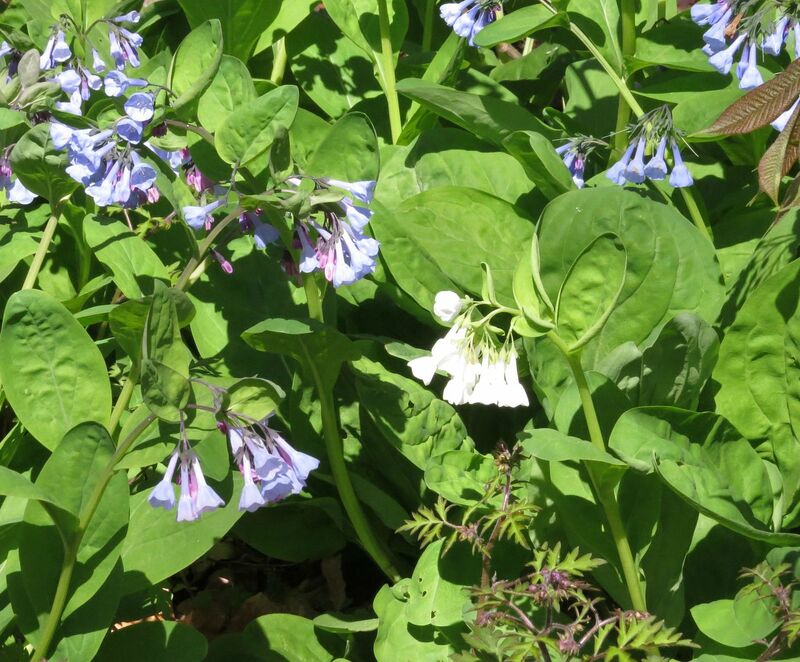 The Virginia Bluebells are peaking right now, but mixed in here is all Fern-leaf Phacelia and Woodland Poppy, neither of which is really flowering heavily yet. 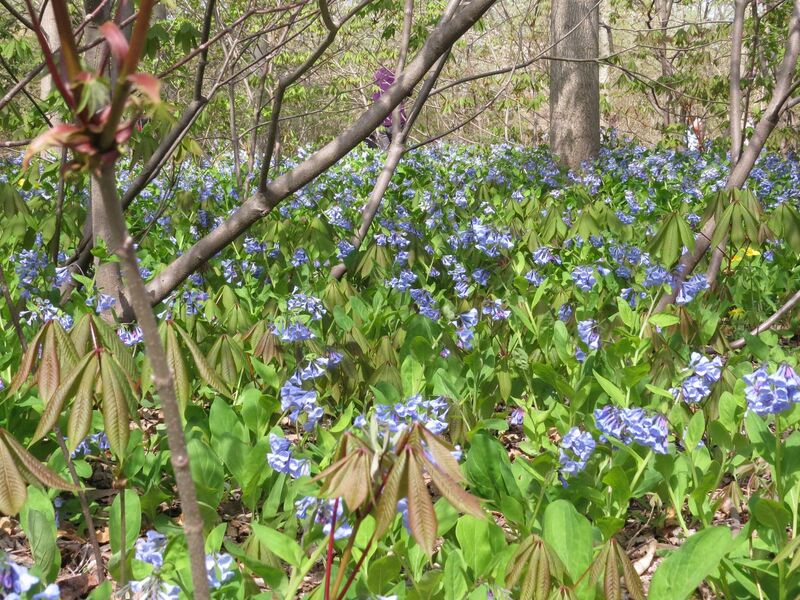 When you have this many of the same species growing in such numbers, variations are bound to show up. 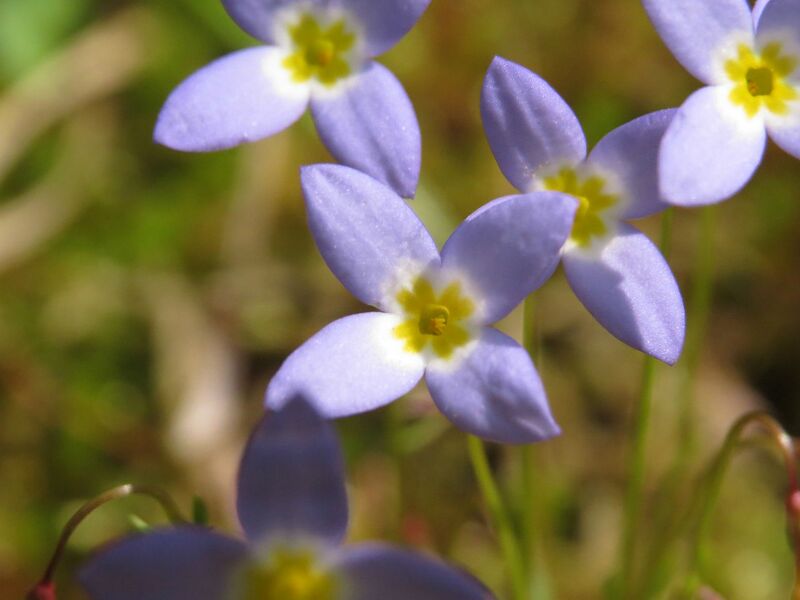 Normally the flowers open up in a tone of pink but quickly turn blue once they open fully. 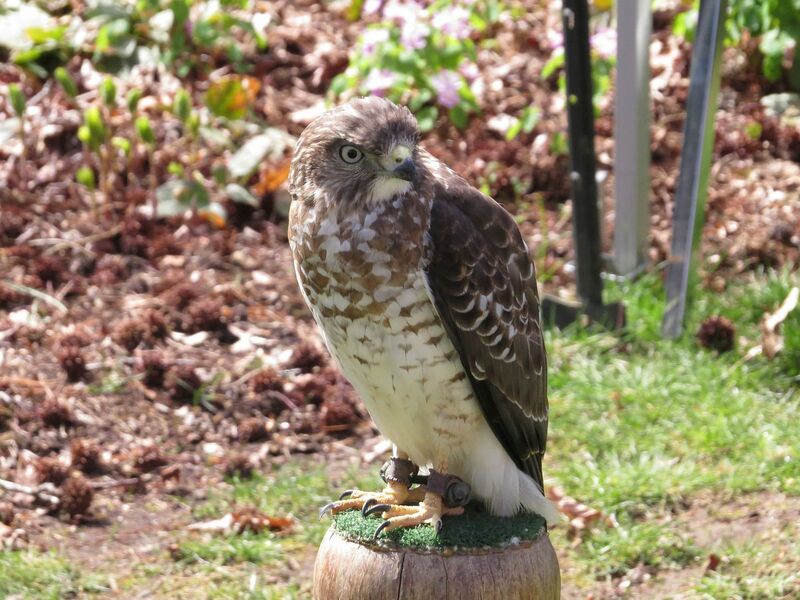 Here is an individual that seems to lack any pigment at all. 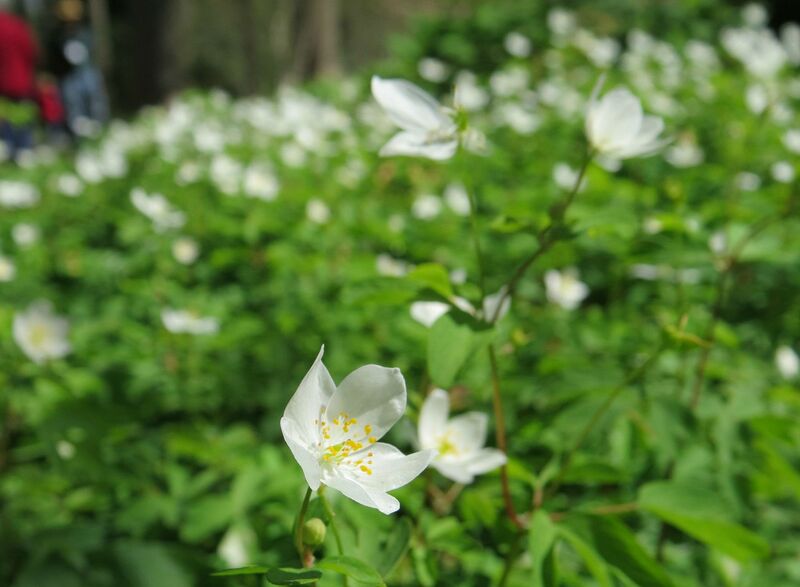 The flowers are simply white. 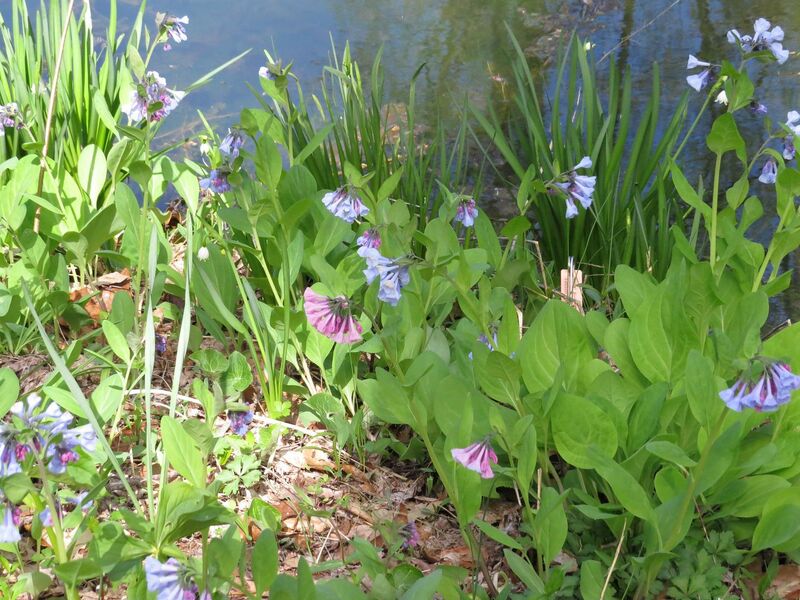 Likewise, these two plants by their pond never turned blue at all, and yet the flowers are fully opened. 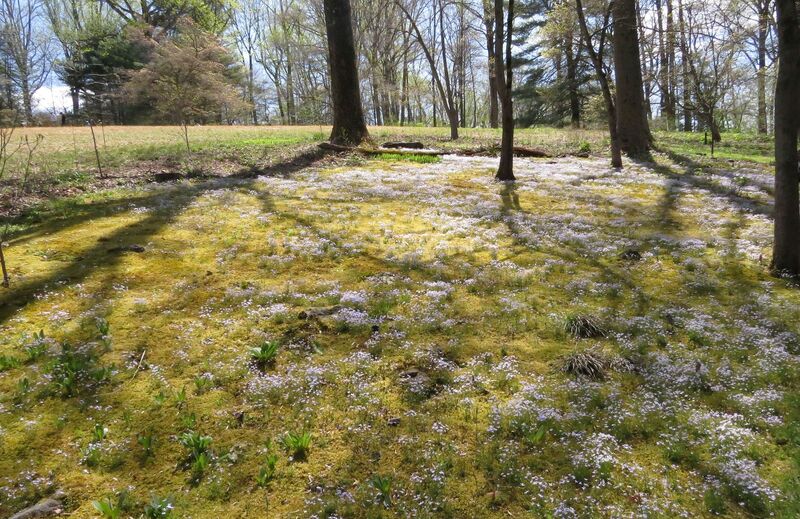 Around the ponds there are small patches of lawn separated by moss patches. I'm told the gardeners use tweezers to maintain this boundary. 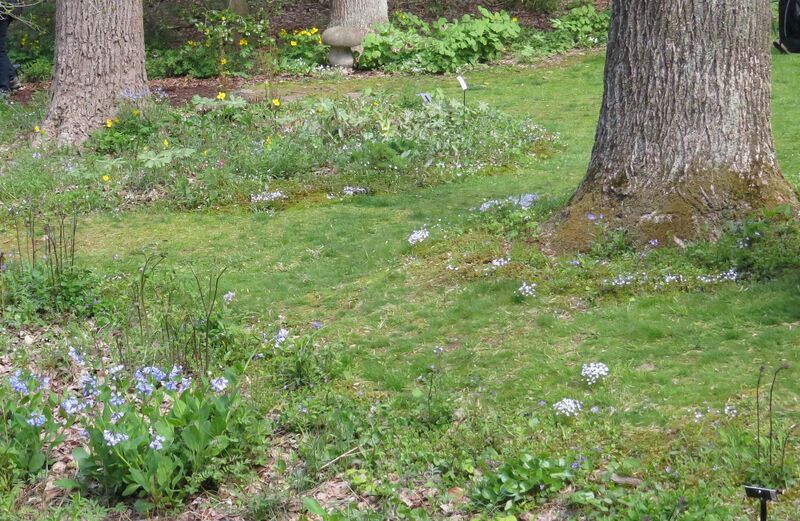 I've come to find mossy patches are the ideal place to grow one wildflower in particular. These are also called Quaker Ladies, though I'm not sure why. Something to do with the plant being small and unassuming except when they bloom. The corms to these plants are about the same size as the flower, and yet each plant somehow pushes out 20 flowers all at once. 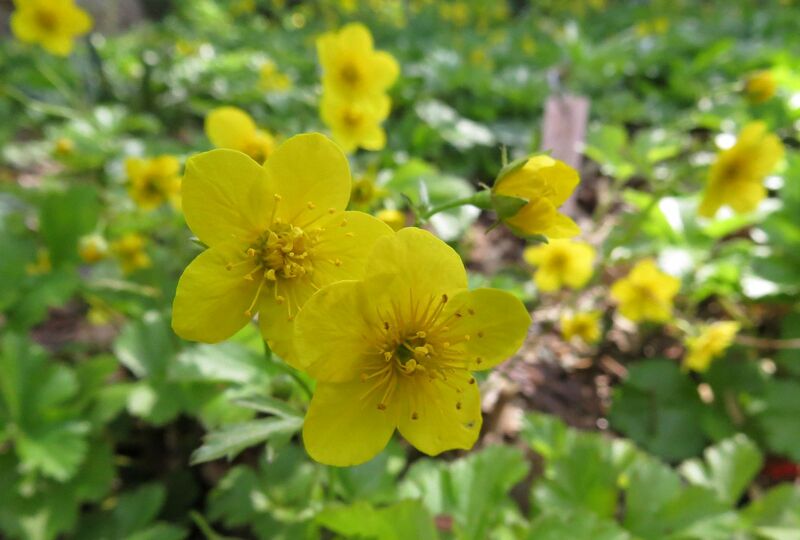 The foliage is a simple rosette of leaves, but even then the flowers take up most of the mass of the plant. They bloom so thick at times that they must shade out the leaves below, though I've never known this to be an issue with an ephemeral. Many of them will produce only a flower and then after it fades push out some leaves. 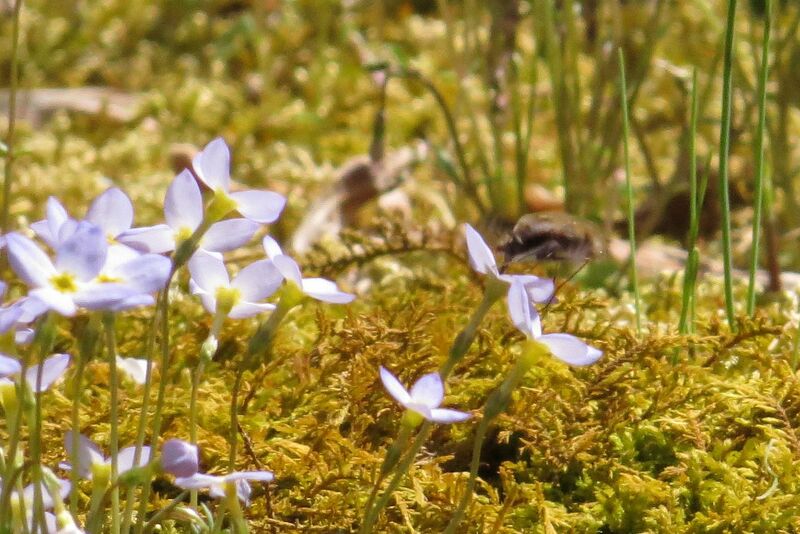 I was happy to find the moss garden full of Bluets this year. In years past, I felt the population here may have been dying out. 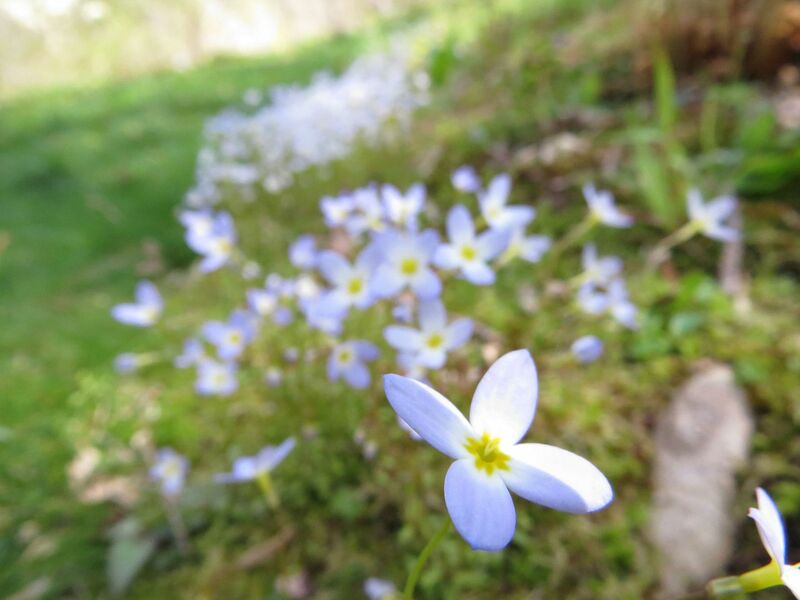 Before I knew what a Bluet was, I honestly thought there was a patch of snow up on the hill for some reason. You almost want to dive in and make a snow angle. This year the effect was there, though shrubs planted right before the patch ruin the surprise. Even here there are unique individuals growing. One plant (yes one plant makes that many flowers!) 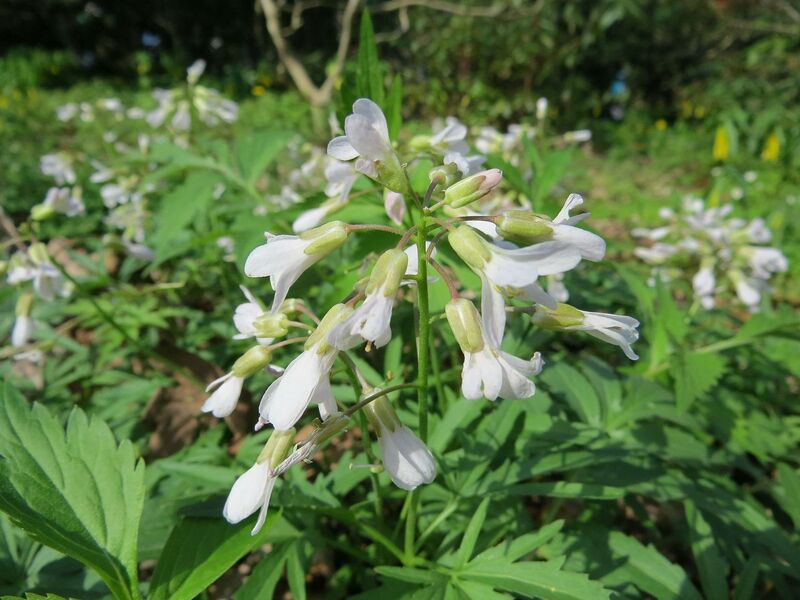 had only produced white flowers. 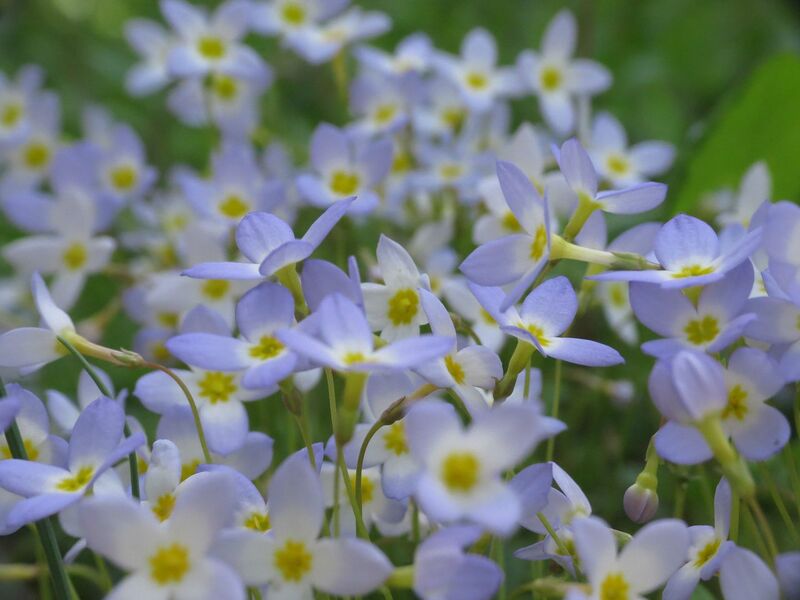 It stood out in a sea of pale blue flowers. Beeflies were buzzing about pollinating them. You can sort of see one here, though they zipped around mostly in the middle of the patch and they frown on walking into the garden beds. 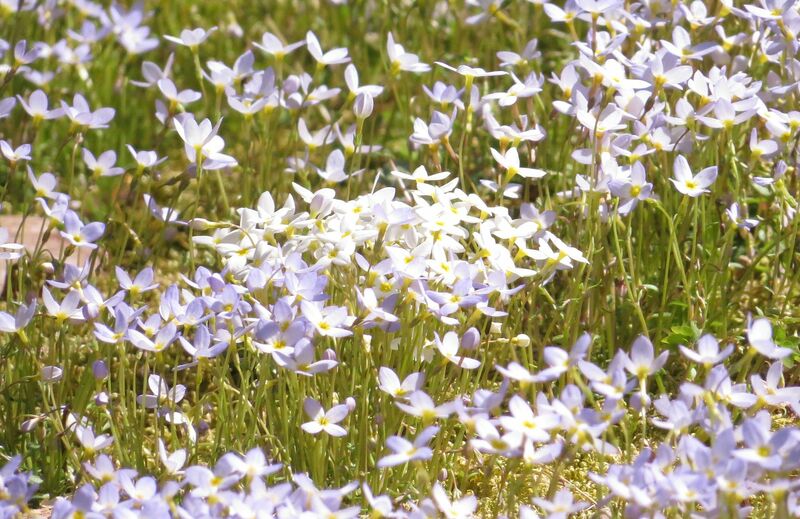 I tried to grow bluets once. They over wintered just fine, and flowered the following spring, however, come summer they died off sadly. I believe growing them in moss is somewhat vital to their survival as they are delicate little evergreen plants. Considering the size of their root they're probably not drought tolerant in the slightest. But the real highlight of the Mt. 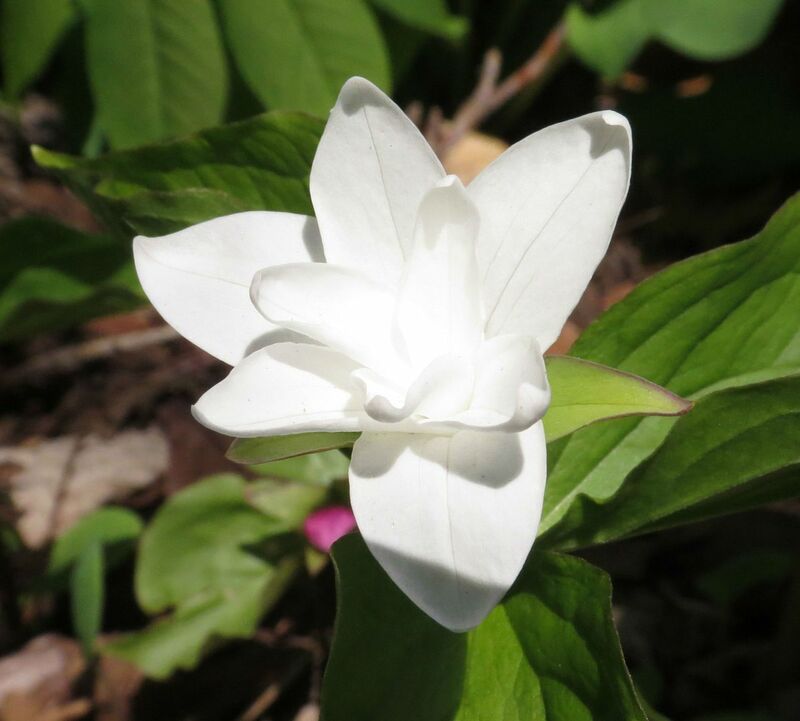 Cuba Center in the spring time has got to be the Trilliums. 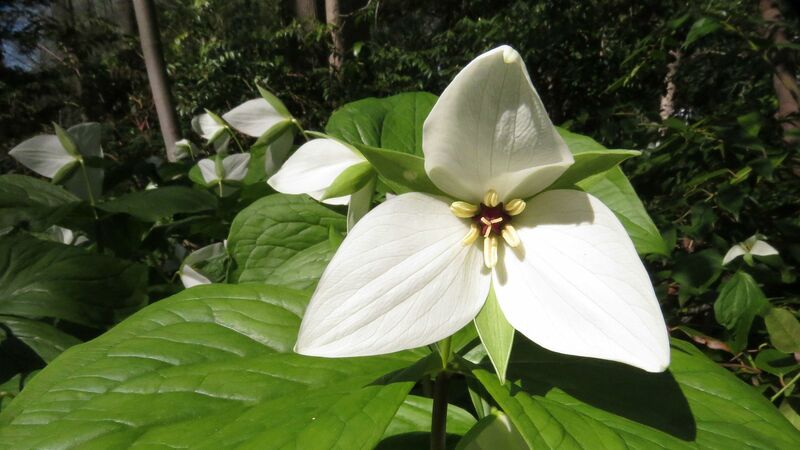 Many people were passing them by unaware of the glory of these amazing plants. 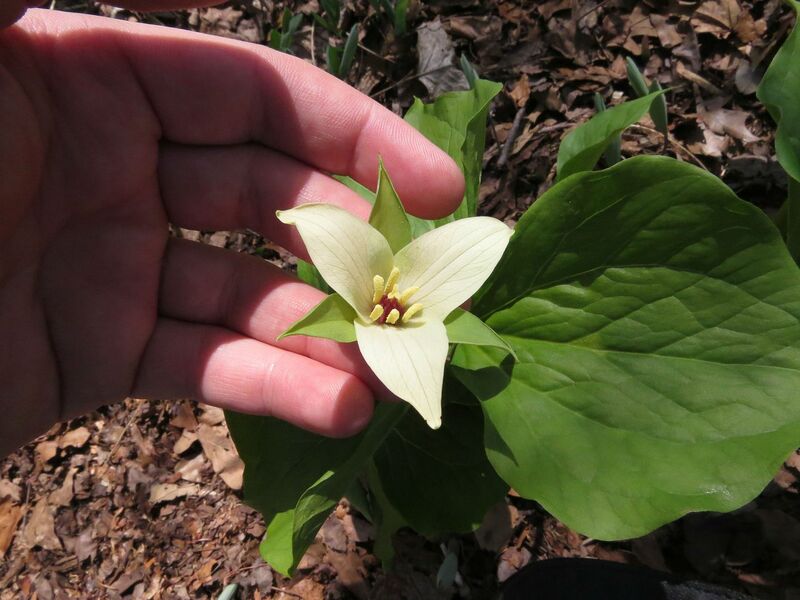 For starters it's unusual for a native plant garden to not have at least one species. 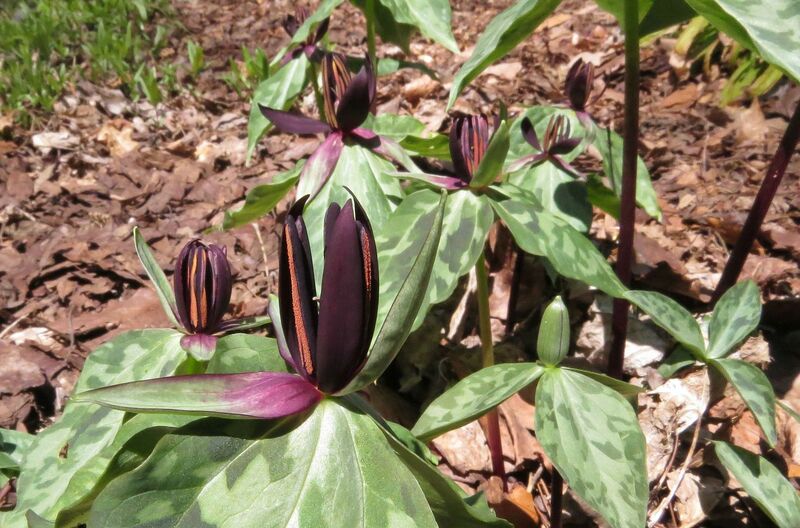 These take two years from seed to germinate, producing a simple single leaf on the third year and that's all. Year four they may produce two leaves, and then three leaves on the fifth. Then sometime between year six and ten, they should flower. From there they can slowly divide more flowering shoots to very slowly form a clump. 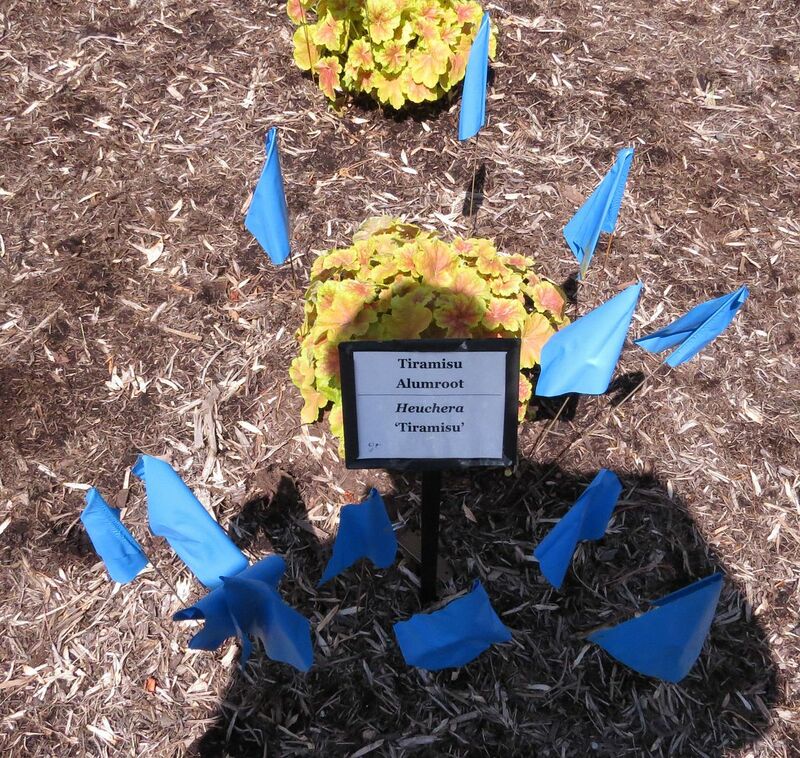 They don't like fertilizer, even the slow release stuff will diminish the size of the rhizome or kill them. They like to grow in full shade, and can tolerate partial to full sun, provided they're watered regularly once a week. Lack of sufficient water (whether in full sun or shade) can cause the seed pod to shrivel up and die. Seeds are coated in elaiosome, which is basically ant food! So your seeds can walk away on you if you're not careful. So in summary these plants are tricky to grow and take the better half of a decade to flower. 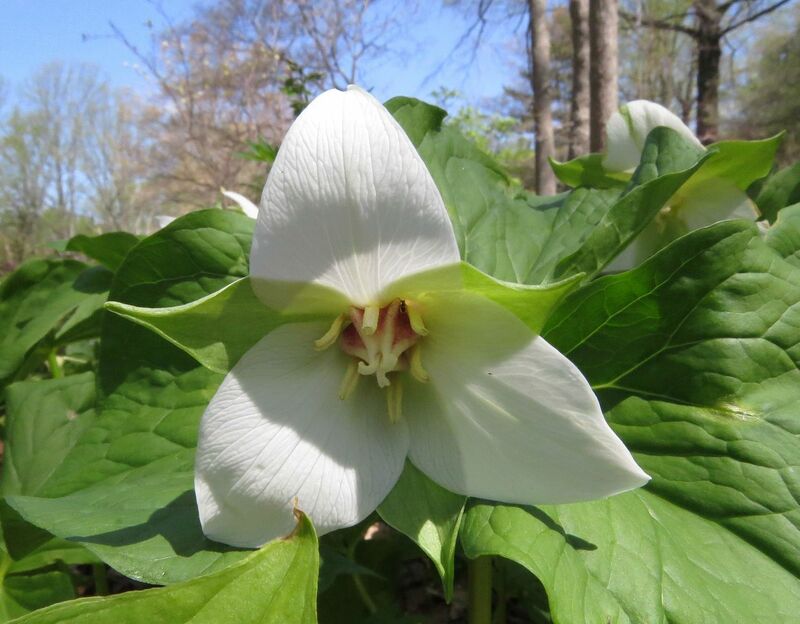 Trillium grandiflorum is probably the most well know and beloved of the Trilliums. 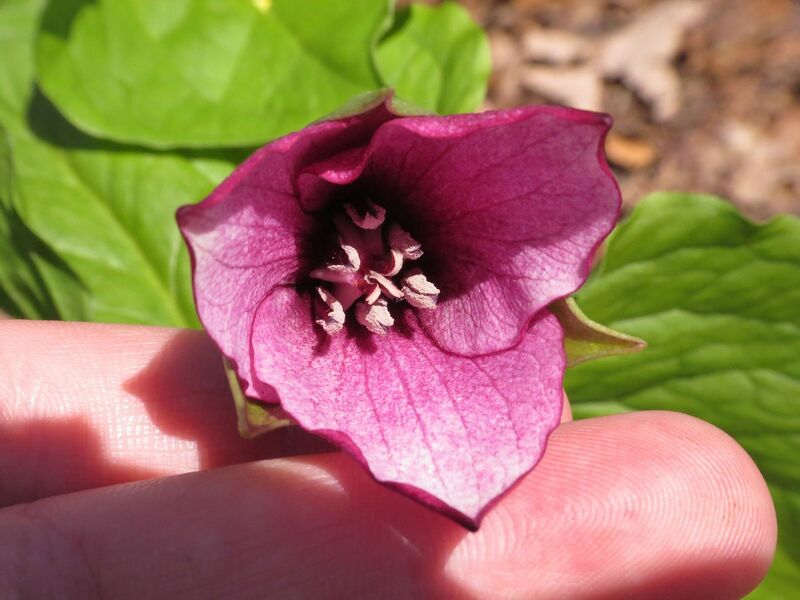 It's the provenance flower to parts of Canada, and illegal to pick or dig up there. You can still find nurseries selling them but expect to pay something around $10 to $20. As a side note I had always wondered why the Mt. 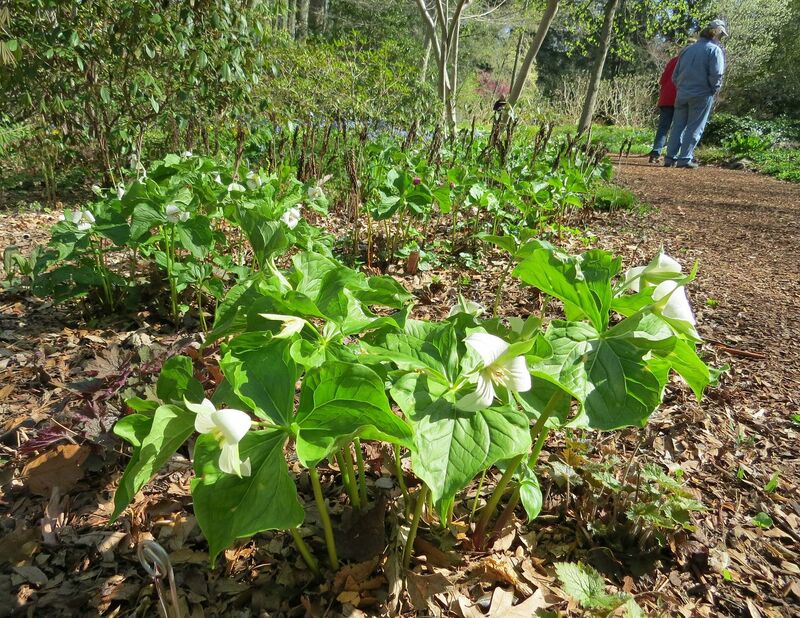 Cuba Center had a section called the Trillium Garden, when it's clear to anyone that they have more Trilliums planted in big patches elsewhere in the gardens. But then I realized, this is where they keep all the cultivars and hybrids that have popped up over the years. 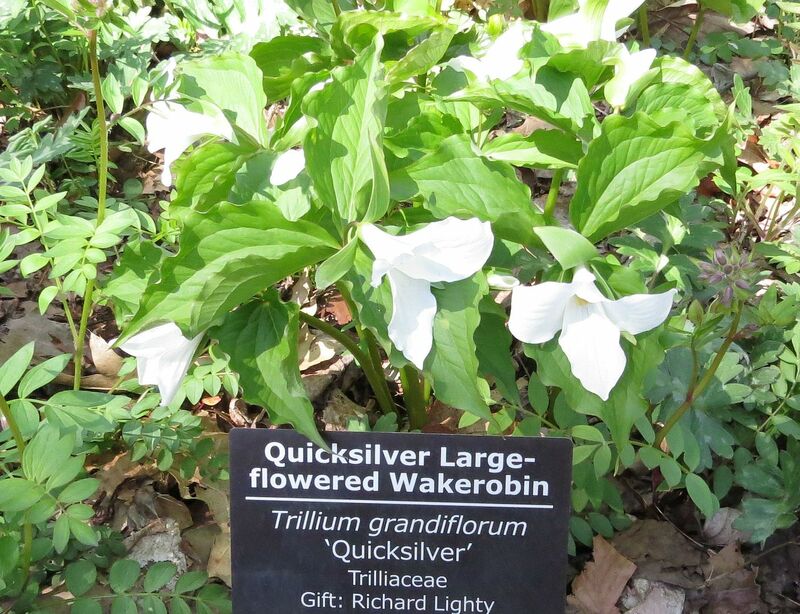 Trillium grandiflorum 'Quicksilver' is fairly true to the true species, however it supposedly spreads faster than the true species. I didn't get the name of this one but it opened slightly pink. Normally they turn pink and magenta after a week of flowering white. It's not a huge difference but still a note worthy one. Another cultivar they had opened as a more striking magenta. This one doesn't have any reproductive parts at all. The flower is useless but this plant is still able to spread by an expanding rhizome which even divides every few years. 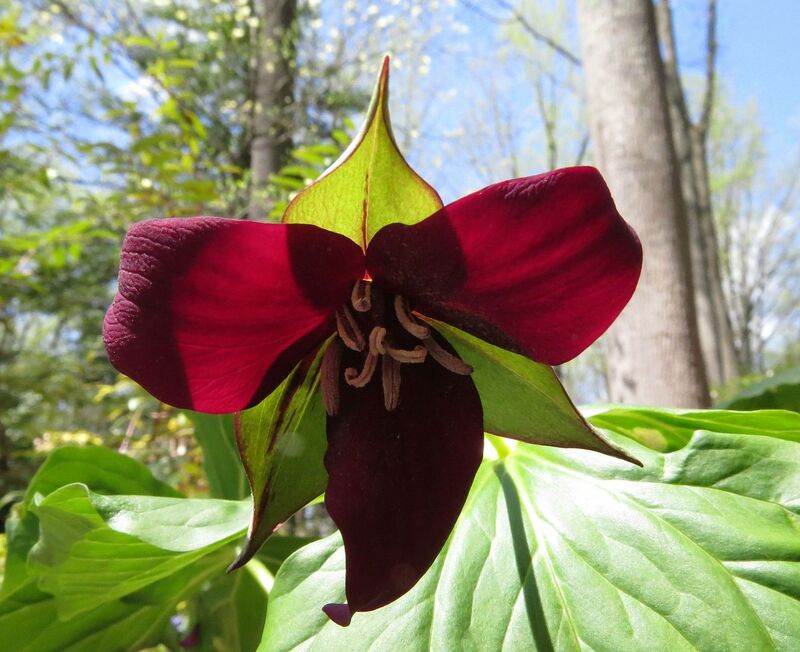 Trillium erectum is probably the prettiest of the red flowering species. 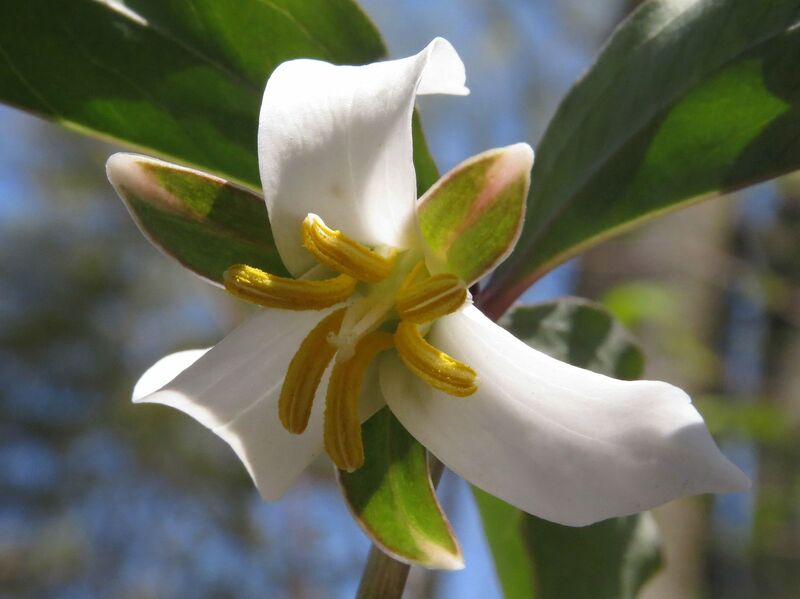 Despite it's beauty, the flower smells like a dead fish to attract flies and carrion beetles to pollinate it. Thankfully one has to practically put their nose inside the flower to observe this fact. 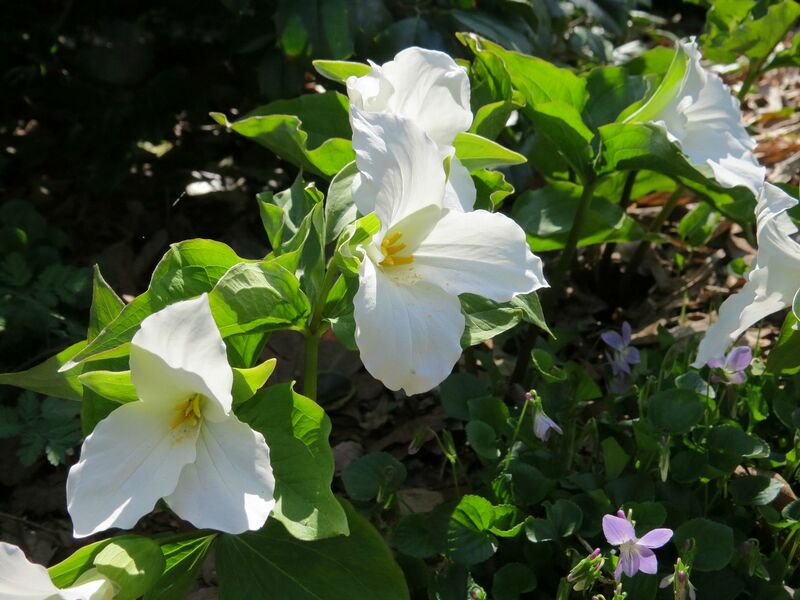 Trillium cernuum is a neat one on par with T. grandiflorum. The flower is a bit more open though. 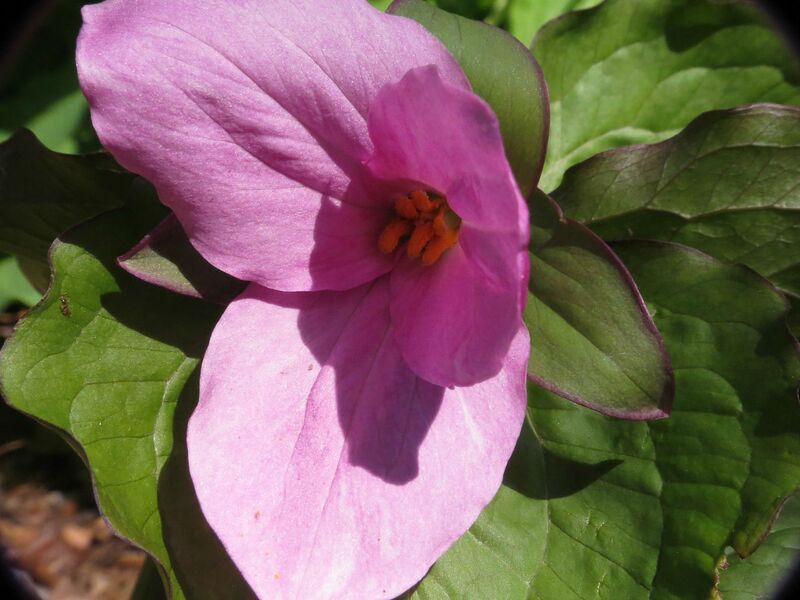 Trillium catesbaei. This is truly one of the prettier species to have, but harder to grow. They don't divide too often and it's even more difficult to get them to reproduce by seed. 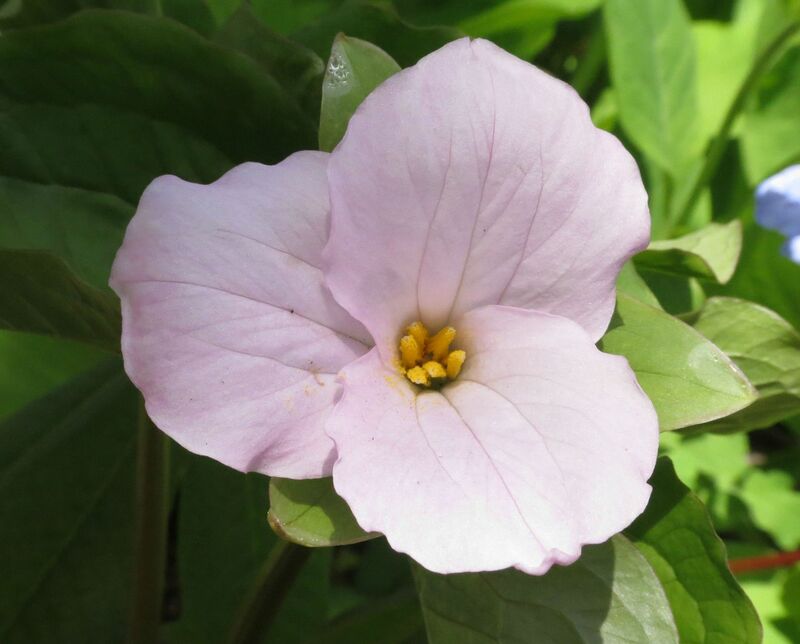 The flower opens white but later turns a sharp shade of pink. 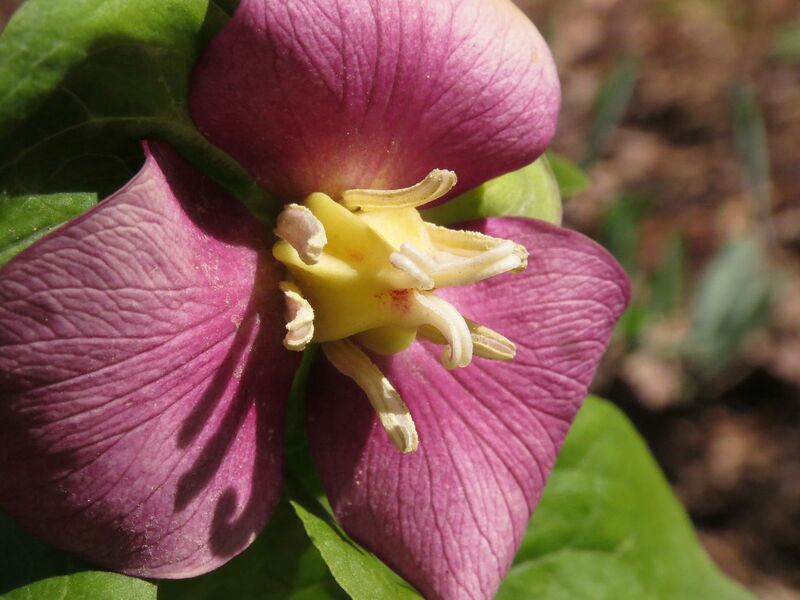 Trillium simile. 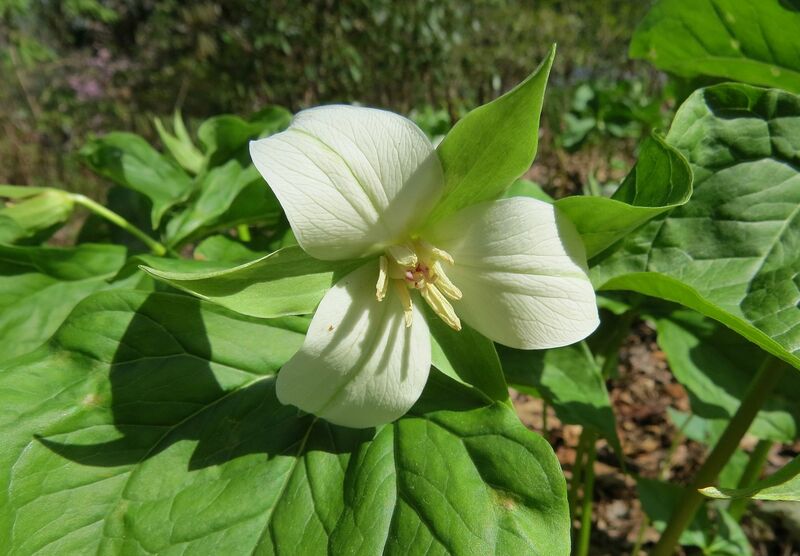 This is actually my favorite Trillium. The flower is almost a perfect triangle. A life goal of mine is to someday commission a piece of jewelry in the shape of this flower. Not sure what it would be called but something to pin above a breast pocket on a suit, or cufflinks perhaps? Elsewhere in the gardens there was a patch that had been flowering a little bit longer. You can tell from the developing seed pod. I was also thrilled to find a mutation! This one has four petals instead of three! 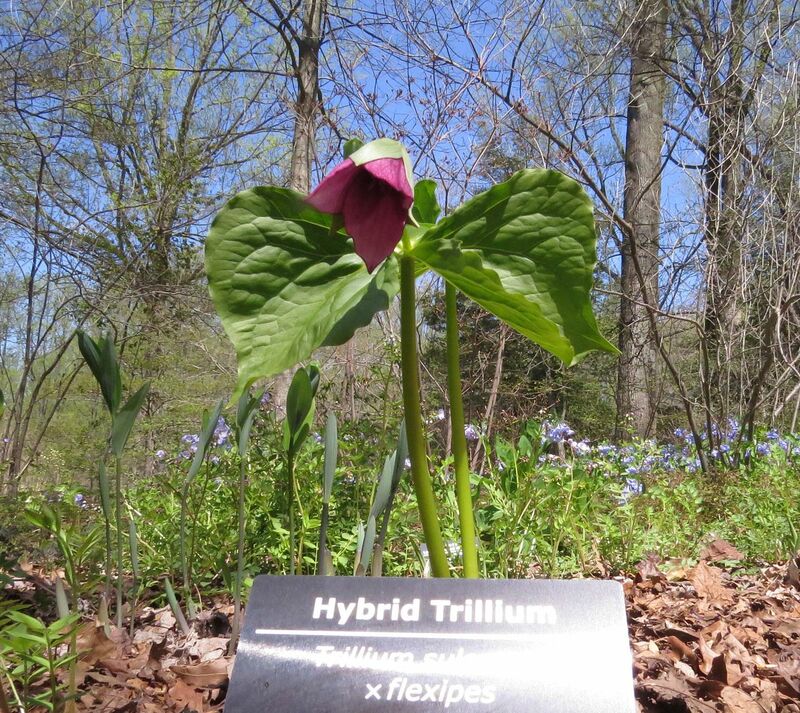 Trillium flexipes x erectum, this was a neat one to see. 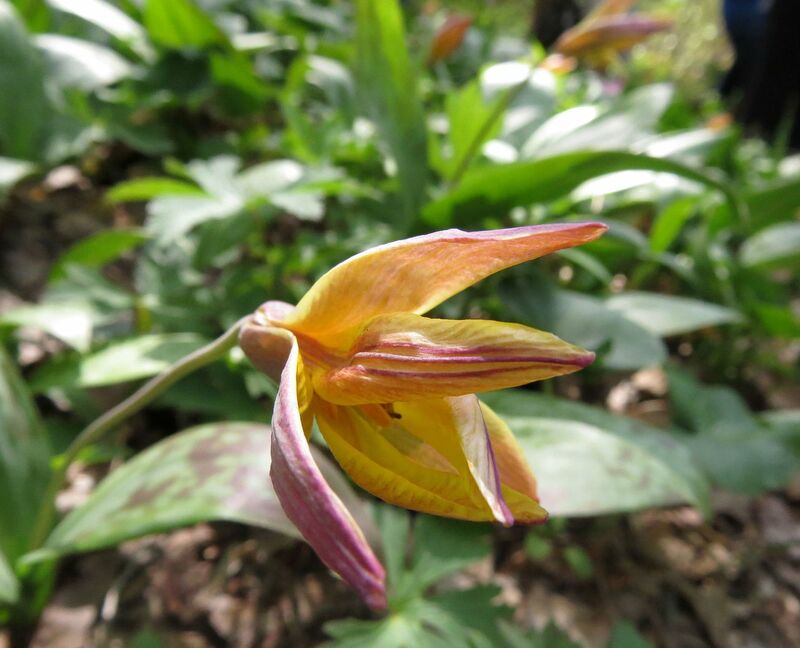 The flower resembles that of T. flexipes while the color is more in line of T. erectum... I didn't think to check if it smelled of dead fish like T. erectum. But it seems to bloom when T. erectum does because I don't recall seeing any T. flexipes open. 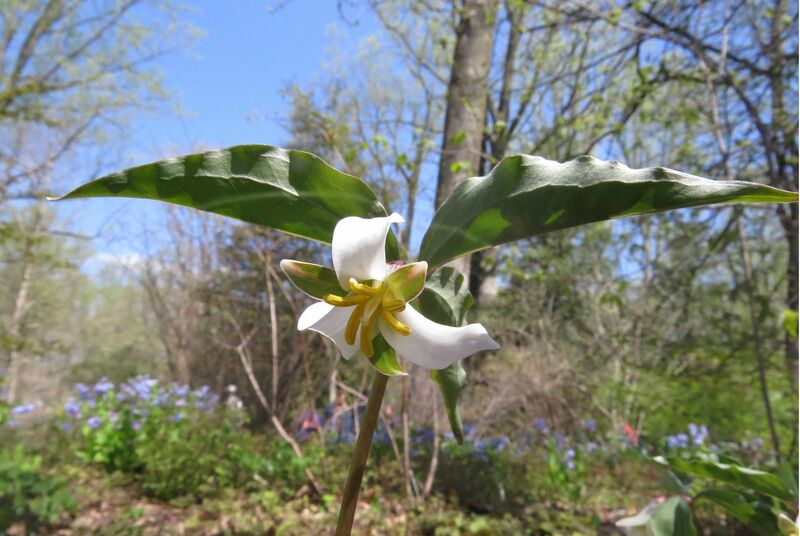 Trillium sulcatum x flexipes. Another flexipes hybrid. Another hybrid with T. flexipes, though this time most of the reproductive parts and color seem to come from T. sulcatum. I believe this was the only patch of this species growing there. 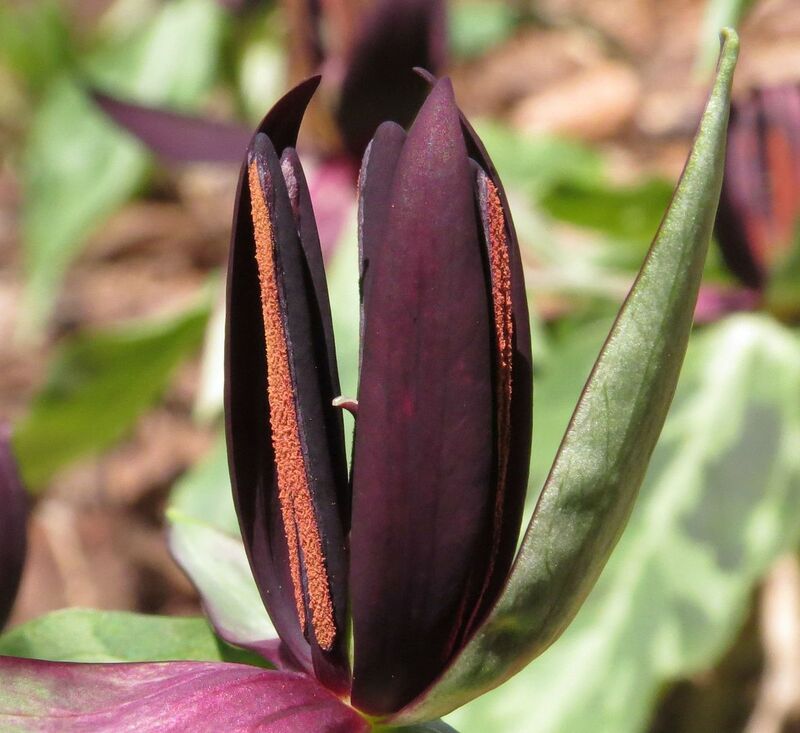 I like the darkness of the flower and earthy tone of the pollen. 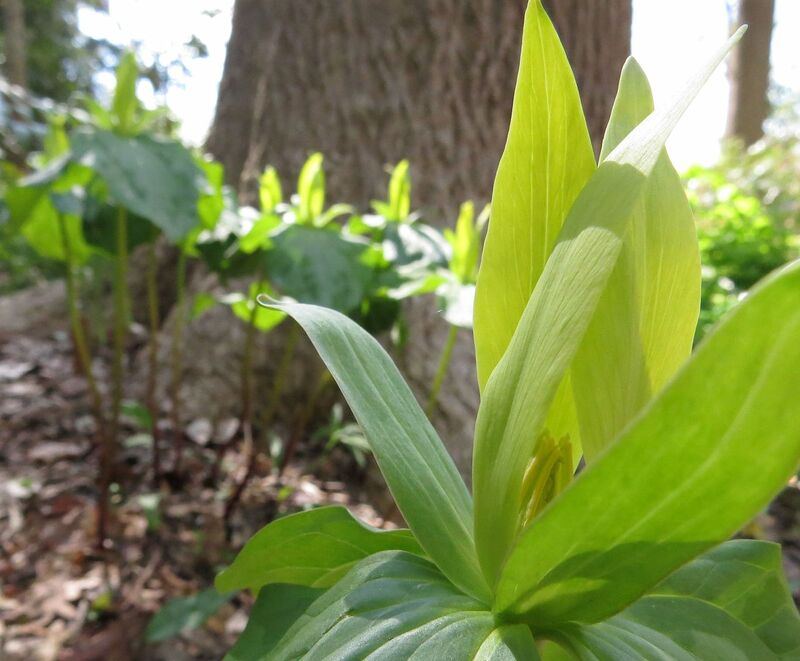 Trillium luteum. 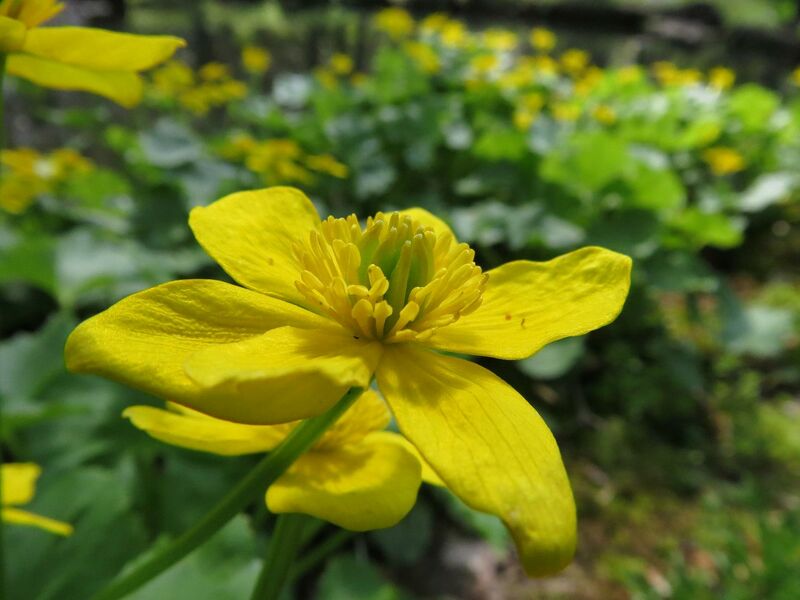 This species is one of the only yellow flowering ones. It also smells like oranges, very pleasant. This is another easy to grow species. Outside of the gardens they had food and activities about up near the main house. They still had a trial of Heuchera's going on in their trial garden. I was handed a flag and asked to pick the best one. I was the first to vote for the cultivar 'Tiramisu' and later when I went back I saw it was actually winning of what had to bee some 50+ varieties. I picked it because the amber and purple foliage ones didn't appeal to me, and I didn't like the red or lime green ones, so I found one that was just green enough but also with just the right amount of copper in the leaves. 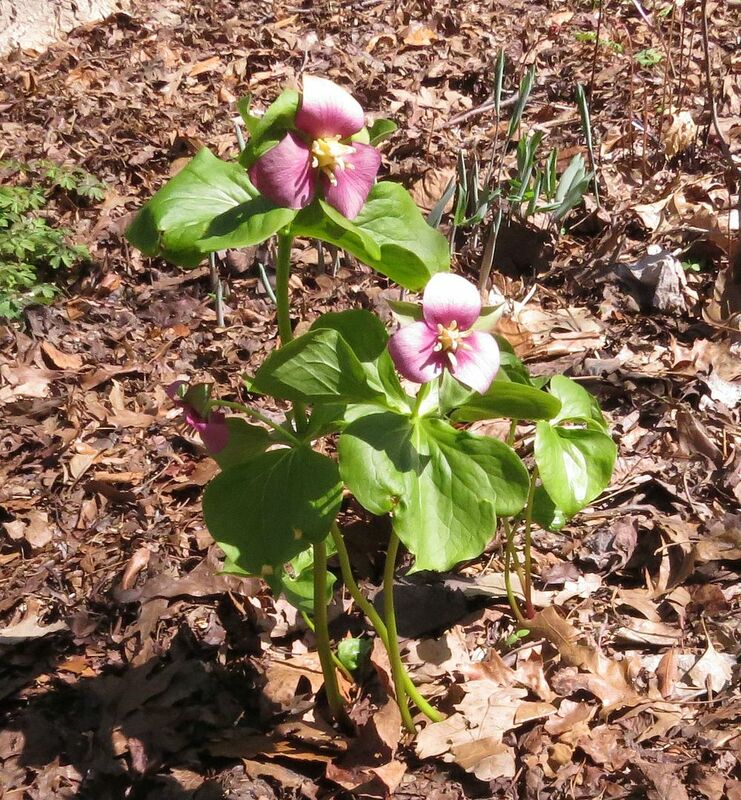 There was another cultivar right next to it that barely had any copper in the leaves at all. The Round Garden sits directly beside the house. Delphiniums and tulips were the biggest splashes of color here. 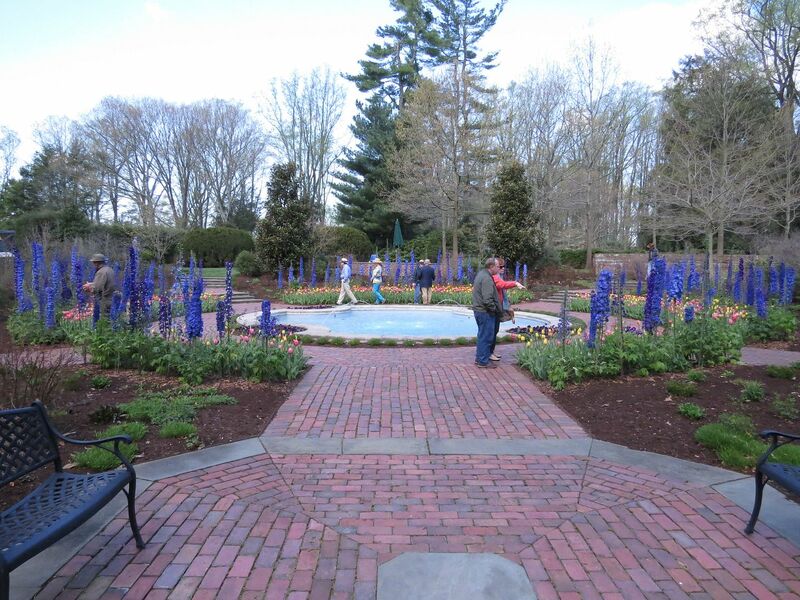 It's a more formal garden and Mrs. Copeland was fond of Delphiniums so they plant them every year in her memory. I think it's lovely, but frankly if I lived there, that pond would be converted into a hot tub so fast! 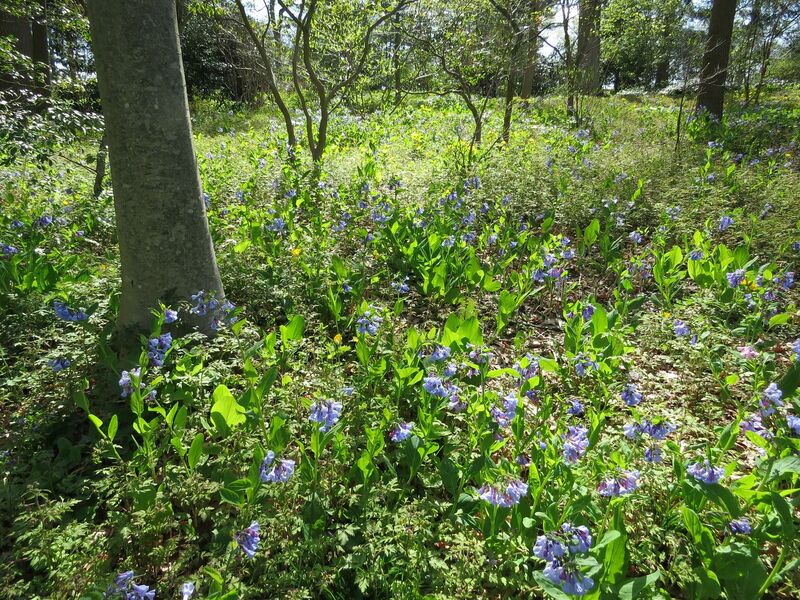 Also planted in this garden are the more formal and garden friendly cultivars of native plants, most of which flower over the summer. 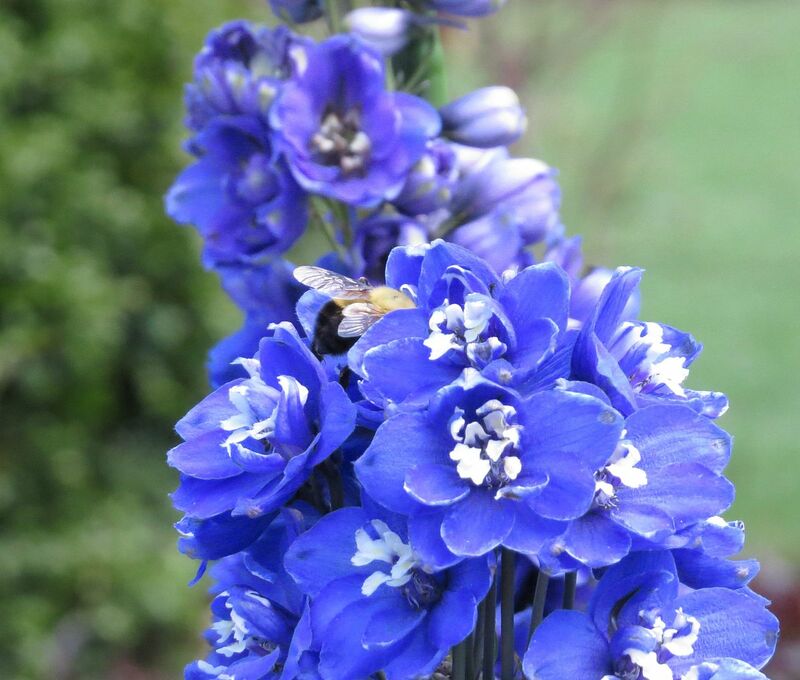 Bumblebees were working the Delphiniums. and so did this small child apparently. 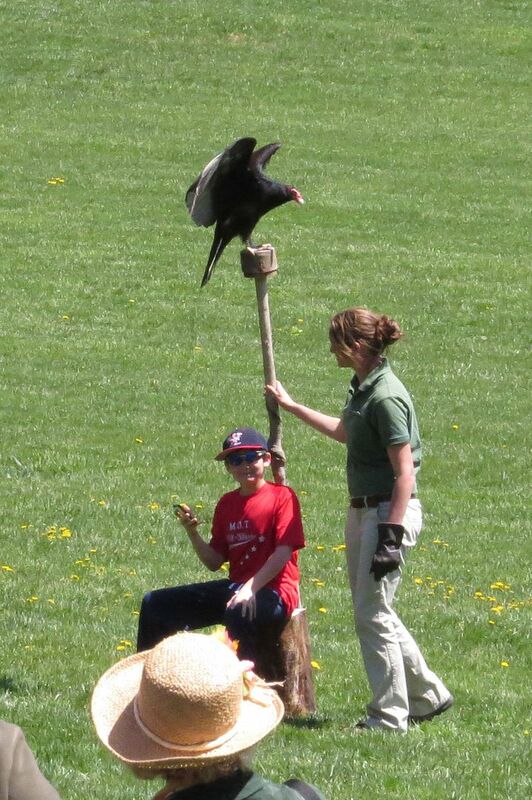 They did this great thing this year where they asked for a young volunteer with a camera to take a seat right by the perch for the Turkey Vulture. He probably got an amazing photo too. When not preforming, their birds were perched out for all to observe. 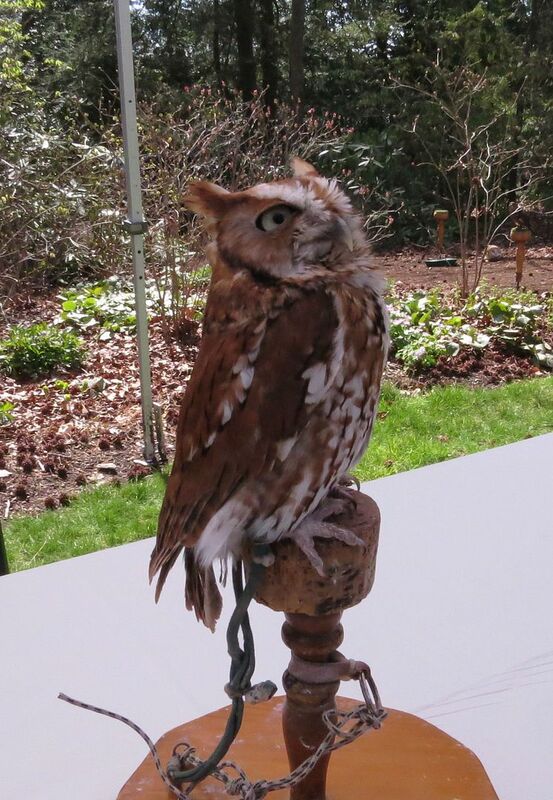 I'm not really a bird person but I know this is a screech owl. 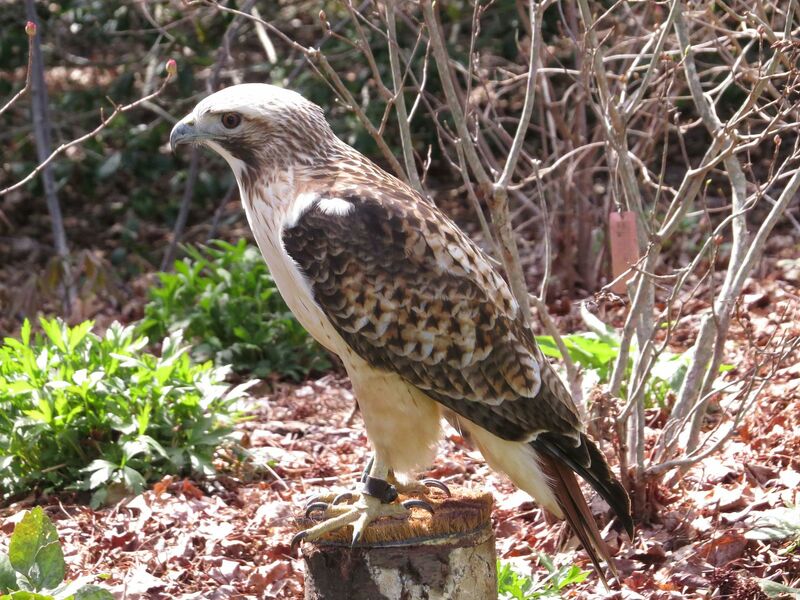 Peregrine Falcon? 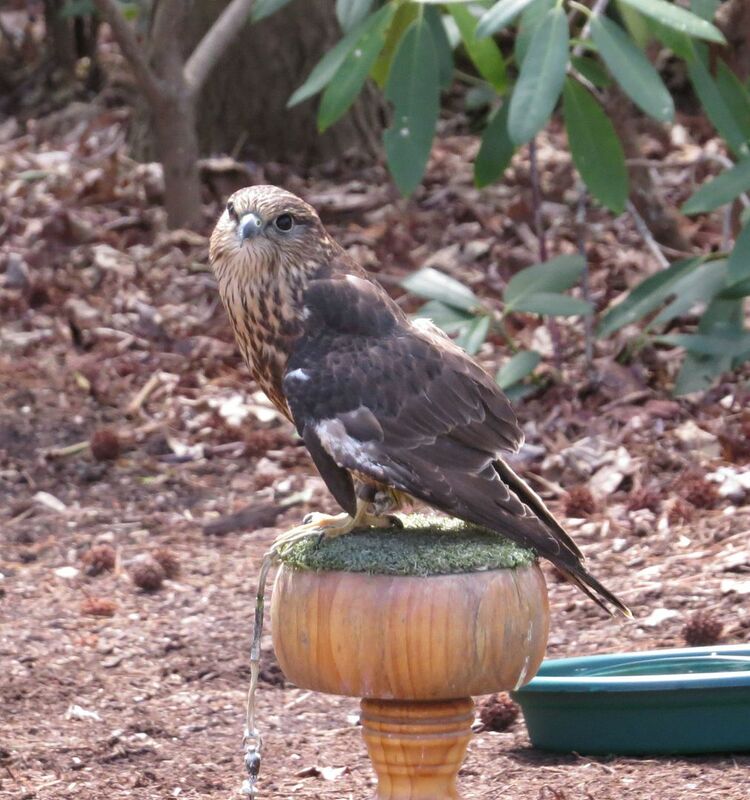 Some type of falcon? A bird... (or plane) of some sort?